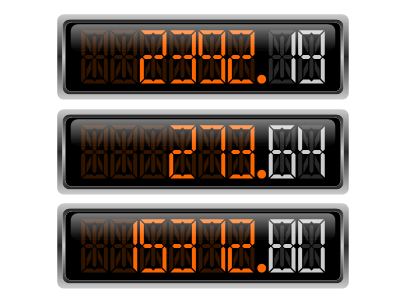 Numeric displays are used to visualize a floating point value in Light-Emitting Diode (LED) fashion. Nevron Numeric Display panel is very useful to display numerical information (values) in LED fashion with different styles. Numeric displays are used to visualize a floating point value in Light-Emitting Diode (LED) fashion. Nevron Numeric Display panel is very useful to display numerical information (values) in LED fashion with different styles. The example demonstrates combination of Numeric Display and State Indicator. Numeric displays are used to visualize a floating point value in Light-Emitting Diode (LED) fashion. Nevron Numeric Display panel is very useful to display numerical information (values) in LED fashion with different styles. The example demonstrates combination of Linear Gauge, Numeric Display and State Indicator.